You just start to forget things after being sleep deprived for months. I’ve forgotten to pay bills, forgotten to set doctor’s appointments, I’ve forgotten what it’s like to be on time to an event… I also forgot my daughter’s birthweight. So, earlier this week I went to my 6 week postpartum appointment (except it’s been 8 weeks. I forgot about this too). The nurse is asking me all the usual questions: Do you smoke? When was your last cycle? (Umm like 6 years ago because I keep having so many children). Then she asks What was your daughter’s birthweight? And I blanked. Numbers shot through my head: 7 pounds 3 ounces (nope, that was Noah), 9 pounds 14 ounces (no, that was Tim), maybe she was 7 pounds 3 ounces (no, Isaac was the other 7.3)… Y’all I seriously could not remember how much my daughter weighed. I tried to brush it off and not feel like the worst mother in the world. Then as I was going to a room and waiting on the doctor I saw I missed a call and that a voicemail was left. Now, I’m normally terrible about checking voicemails and usually wait until I have about 17 voicemails and then knock them all out at once, but I figured I had some time to spare so I listened to it. Turns out I also forgot that it was Timothy’s first day of Mother’s Day Out. Crap, crap, and double crap. From that point on until the end of the day I had this reoccurring thought… You’re a bad mom… This played in my head over and over, and as a result, my actions portrayed that for the rest of the day. I had less patience with my boys, I didn’t bother with carving out my usual 10 minute prayer time, and I was just plain grumpy. What I didn’t realize was that I had also forgotten a few very important things. Remember that reoccurring thought of You’re a bad mom? I forgot that it was a lie. I’m not a bad mom. I’m not perfect, but I’m a good mom and that’s good enough. 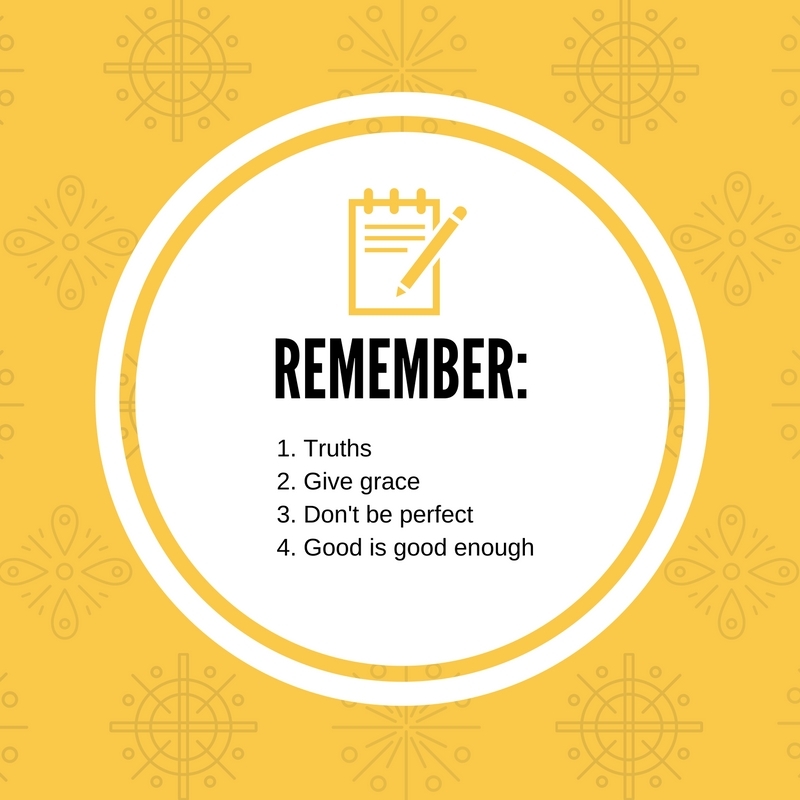 We as parents, as spouses, as friends don’t have to be a perfect parent, spouse, or friend; but we can just be a good one… I wish we (I wish I) would just remember this. No one is perfect, and we shouldn’t strive to be perfect. We all have room for growth, and it’s okay to want to work on that, but let’s not waste what little time we have focusing all our attention on our shortcomings that we miss the blessings right in front of us. I also forgot to give myself grace for the moment. I haven’t had a full night’s sleep in months. Keeping 4 kids alive is challenging enough, and trying to remember dates and details is even more of a challenge. We all forget things from time to time, and it’s not the end of the world. 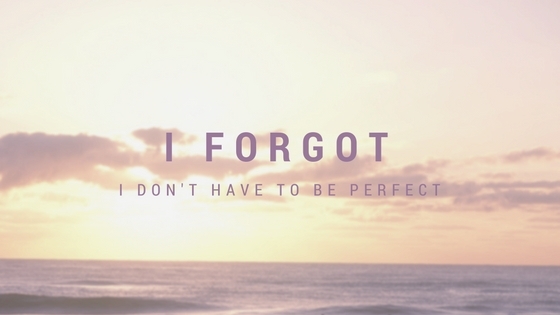 I also forgot that I don’t have to be perfect. “Being a good mom” isn’t defined by my forgetfulness. I’m a good mom because I love my kids. I love my kids and I’m trying my darn best to provide a good (but not perfect) home life for them. Soon they will all be in school and I don’t want to spend these short years I have with them at home beating myself up for things that don’t even matter; and neither should you. So I challenge you fellow moms and dads and caregivers and grandparents: Forgive and forget your shortcomings, and make the most of your day with your littles by showing them just how much you do love them.